Prism Medical UK has raised a magnificent £750 on Pink Friday for Breast Cancer Care, the UK based charity aiming to provide treatment and support for those affected with breast cancer. The number of people diagnosed with breast cancer is increasing year on year; however survival rates are improving thanks to the help from charities such as Breast Cancer Care. In order to raise money to continue the support for those affected with breast cancer, Prism held a Pink Friday on 25th October at three Regional Service Centres. 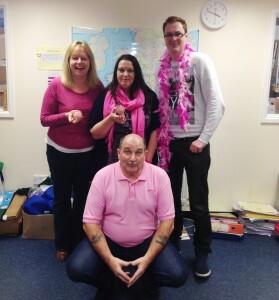 Employees wore pink and baked cakes in return for a small donation to the charity.